Please sign the petition linked below to help Dr. Aafia Siddiqui, a political prisoner, and also a victim of state terrorism. 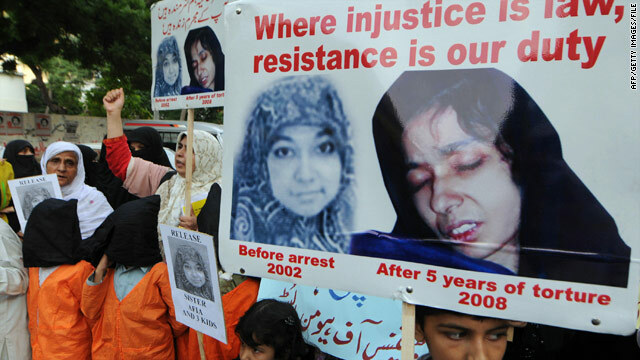 Aafia Siddiqui has been abused, humiliated, shot, and driven to the edge of sanity. She was tried for one crime and convicted on the basis of false evidence of another. There was no evidence other than some contested witness statements that the crime she was convicted of even occurred.. The secret evidence used to identify her as a ‘terrorist’ would never have stood up in an independent proceeding where it was subject to any sort of scrutiny. Her cause is a ’cause celeb’ in Pakistan where she is a symbol of U.S. perfidy and injustice. Although the jury convicted on all counts they did not support premeditation. Yet the judge sentenced Siddiqui to 86 years instead of the 13-15 years suggested under the law. Siddiqui is currently incarcerated in a U.S. Medical Prison in Texas called Carswell FMC (Federal Medical Center). She was suffering from the symptoms of severe PTSD at the time of her trial, though the court denied this because the US Government said that they had never harmed her. Siddiqui does not receive her mail and is rarely allowed a phone call to speak with her family. I write to her regularly and all of my letters are returned. Aafia Siddiqui is in Carswell for 86 years, longer than the natural span of her life. She is locked away so that she won’t be able to tell anyone about the horrors perpetrated against her in Bagram and possibly some other black sites in Pakistan and Afghanistan where she spent the 5 years after her abduction with her children from the street in Karachi near her family home. When it became clear that people were looking for her in the system and there was a risk she would be found, she was cut loose in Afghanistan so she could be openly arrested and locked away. At the time reporters were looking everywhere for her and asking a lot of uncomfortable questions. Repatriate Dr. Aafia Siddiqui, imprisoned for more than 11 years, as a matter of urgency. In the name of ALLAH, The Most Compassionate, The Most Merciful. We appeal to you as brothers and sisters in humanity to relieve the suffering of an innocent woman. In March 2003, Dr. Aafia Siddiqui was abducted with her three young children in Pakistan on the basis of faulty intelligence, a rendition operation that a former Pakistani official has since admitted. Five years later she mysteriously reappeared in a weakened state in Afghanistan; she was shot and later charged in a federal court with attempted murder. Dr. Siddiqui was sentenced to 86 years for a “crime” in which she alone was injured, she has now suffered needlessly for more than 11 years. We ask the government to affirm the American ideals of “liberty and justice for all.” End Aafia’s suffering; reunite her with her family. I have written quite a bit on this subject. In 2012, I met with Dr. Fowzia Siddiqui, Aafia Siddiqui’s 2 remaining children and her mother in Karachi. Since then I have done considerable research around Dr. Aafia’s disappearance from Karachi, her reappearance in Ghazni.and subsequent arrest, and her trial. My articles can be found in this blog by searching on her name.